Just a quick post to show you what I have been working on this week. I am keen to finish the Purple Patch Quilt that I started last week, and I am nearly there. 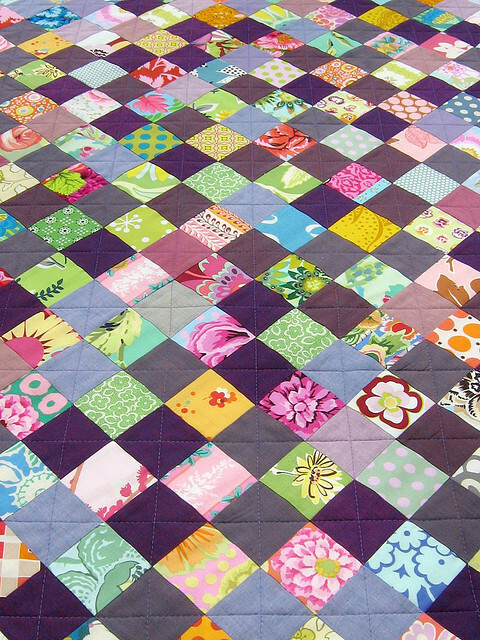 The solid fabrics used in this quilt were all shot cottons by Kaffe Fassett including Lilac, Lavender, Heather, Prune and Grape. Shot cottons are not true solids as they are woven using cotton thread which is dyed in small batches. Variations in color and small imperfections in the weaving are a natural part of the process. Tonal variation for warp and weft create soft and subtle shifts in color. I enjoy working with shot cottons as they come in a range of vibrant as well as subtle colors, and if so required, can add more interest than true solid fabrics. I have quilted diagonal lines through all of the shot cottons, providing interest and making a grid of diagonal squares. Just the binding to go now. Its AWESOME!! And thanks for the binding tutorial too! Happy Thanksgiving! I love checkerboard design quilts, and this one is no exception. Your purple blends are a great choice! Your work is an inspiration to so many. p.s. I machine stitch my bindings too, sewing from back, and topstitching on the front. Big time saver. I love the look of shot cotton. The quilt looks amazing and I love the quilting you did on it :) Very nice Rita! I really like this quilt. Shot cottons are great, and I like that you included so many large scale prints in your print fabrics. Really great! This will definitely be a going to be a quilt made by me. I have dyed cotton in various colors and I'm sure it will look great. Now I learn something everyday. I have read the term "shot cotton" in literature but I never knew what the heck it was. Love the quilt! I would not have thought of using purples. oooooooh that is awesome, thank you for sharing. Can you please tell what size square you used and any helpful tips would be great. But I'm not sure about a colour called 'prune'. Might give one the shits!?! Still, all your fabrics and colours work so deliciously together. Beautiful quilt Rita, excellent colours and the quilting is fabulous. Love your checkerboard quilt, Rita, especially the mix of solid purple with all the pattern and colours. So lovely, Rita! 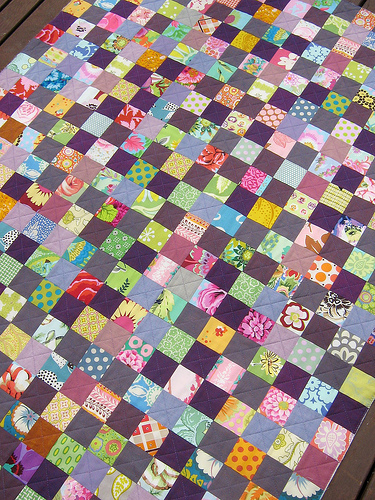 Every little square is singing such a pretty tune in this quilt. The eye moves quickly to see what deliciousness is living next door. I especially love the yellows! Beautiful! You have a great eye for color design. Thanks for teaching me a little about the shot cottons. I hadn't heard the term before. It's a beautiful quilt! Wow, it's stunning. I love anything purple and the subtle differences in the shades is so effective. i really love the colour combinations on this. its sooo pretty. i love the plain purples with the patterns. Wow! It's looking great! I've loved your work with white so much and I never would have thought to use the purple, but I really like it!!! The purple is just divine!! Grape clusters comes to mind for a name. Love the quilt. beautiful quilt!! i love purple! LOVING this quilt. So simple and so inspiring.